This cordless indoor/outdoor camera's intelligent motion detection can capture criminal activity, but it takes too long to get to the video evidence. Wireless, weatherized, battery-powered cameras make appealing home security options. Outdoor electrical outlets are scarce or non-existent on many residential properties, and installing one is a non-starter for a lot of folks, particularly renters. Foscam’s E1, then, should be a welcome addition to the security cam sphere. And it is, mostly. At a glance, comparisons to the Arlo Pro 2 are unavoidable. Like that camera, the Foscam E1 is battery powered, with a modular pod-like design that makes it easy to set up indoors or out. And like the Arlo Pro, Foscam’s camera must be paired with a base station, which is included with the camera in a $200 starter kit. Each base station can support up to four cameras, and additional cameras—identified with the model number B1—cost $130 each. The cameras deliver maximum resolution of 1080p, are outfitted with passive infrared motion detection, and provide infrared night vision that illuminates up to 25 feet in the dark—again, matching features offered by the Arlo Pro 2. But after using the E1 for a while, it’s clear that’s where the similarities end. Foscam’s camera doesn’t have near the level of customizability of Arlo’s indoor/outdoor camera, nor is the user experience quite as elegant. That said, the E1 is a solid security camera if you can tolerate its quirks. Each Foscam base station can support up to four model E1 or B1 cameras. The E1 user manual depicts a tantalizingly simple setup process: Just plug in the base station and connect it via ethernet to your router. Slip the rechargeable battery into the camera, and the two devices will sync automatically. But for whatever reason, it didn’t play our like that for me. After 10 minutes or so of turning the the base station on and off and removing and reinserting the camera battery, I finally gave up and resorted to the method the instructions provide for connecting additional cameras: pressing the sync button on the base station for two seconds, then doing the same on the camera. That did the trick. 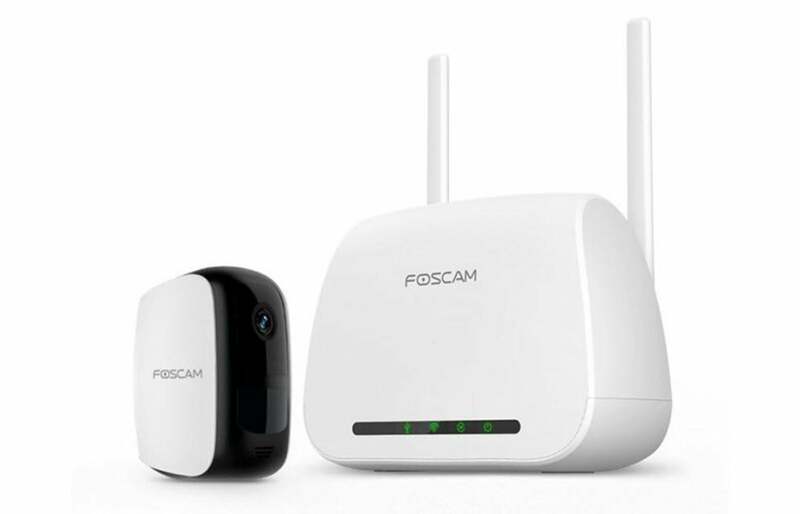 From that point, it was a matter of downloading the Foscam app and following the walk-through guide to add both the base station and camera to my Foscam account. Fortunately, this went much smoother. You can place the camera on a shelf, table, or other flat surface, or mount it to an interior or exterior wall using the magnetic ball mount and supplied hardware. The camera has an IP65 weatherproof rating, making it safe from dust and jets of water, and an operating temperature 32 degrees to 131 degrees Fahrenheit. The Foscam app displays the devices page the first time you launch it. Here you’ll see the E1 along with any other connected Foscam cameras. Tapping the E1 takes you to its live stream. The video is very sharp with rich color. You can change the image quality, but the app doesn’t allow you to define the resolution you want. Instead, you can choose between Maximum Video Quality, Best Battery Life, or Optimized, which is the default. You can pinch the image to zoom in on smaller details, and you can swipe left, right, up, and down to a specific location in the image. If you spy an intruder, you can trigger the base station’s deafening onboard siren by tabbing back to the devices page and pressing the Alarm button. The camera’s controls are easy to access from the live-feed screen. There’s a row of controls under the video pane for manually recording video and taking screenshots, activating two-way talk, and turning on audio and night vision. There are also icons indicating the camera’s battery life and the current Wi-Fi status. On the bottom half of the screen is a timeline representing the current day, where motion-detected activity is logged as blue bars. Tapping the timeline takes you to the Cloud History screen, where you can play back motion-triggered video clips. More on this in a bit. The E1 offers two types of motion-detection alerts: Activity Detection uses the camera’s PIR sensor—which, unlike computer-vision detection, is activated only by body heat—to recognize the movement of people and pets while filtering out other motion, such as rustling or leaves or cars passing by. Human Detection adds an advanced movement-detection algorithm to recognize only people, further reducing nonessential alerts. You can enable either one in the app settings, and both worked accurately in my testing. When the E1 (or B1) detects motion, it records a brief video clip and uploads it to the cloud, where it’s saved for up to seven days free (if you want to keep them longer, you can attach a USB storage device to the base station and download them locally). At the same time, it pushes a notification to your phone. Tapping the notification takes you to the apps Alerts page, where the event is logged and timestamped. Tapping these entries doesn’t take you to the video clip, though, just to a snapshot of the triggering person or pet. The video itself accessed on a separate Cloud History page in the app. Each event is logged as its own blue bar on a timeline. Each time I received a motion alert, I had to note the timestamp on the Alerts page, then navigate to the Cloud History page and scroll the timeline to the that time entry to play the video, which inevitably took several interminable seconds to load. You can switch from the timeline to a list view of all the videos, which makes it easier to find the clip in question, but the process of reviewing what could be criminal activity in your home takes a disconcerting amount of time either way. Presumably, the snapshot is supposed to mitigate some of this by offering a preview, but there were plenty of times the camera only captured a still of someone’s backside, and I needed to see the video to confirm it was someone I knew. 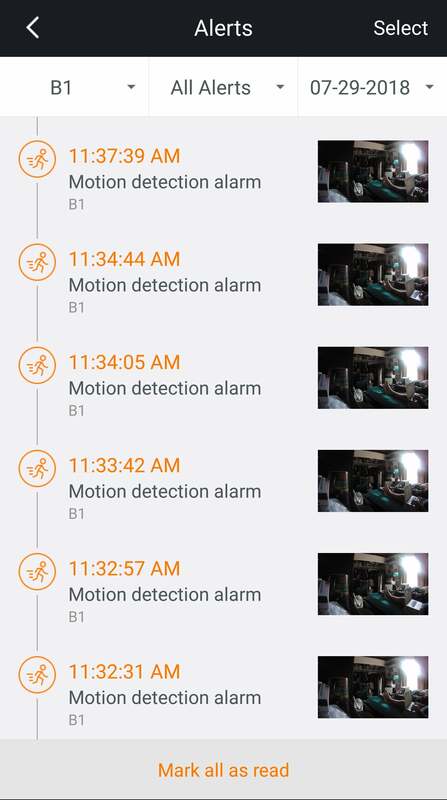 Motion-triggered events are logged with a snapshot on the Alerts page in the Foscam app. When you do finally get to the video, you have the option of taking a still shot—essential if it captures a good look at an intruder’s face—or of downloading a local copy. The Foscam E1 has a lot to recommend it. It’s easy to install in- or outdoors. The ability to record both locally and to the cloud means you’ll always have a backup copy of potential video evidence. The human detection algorithm drastically cuts down on inconsequential motion alerts. And the app has a clean, intuitive design that makes it easy to operate from the get-go. 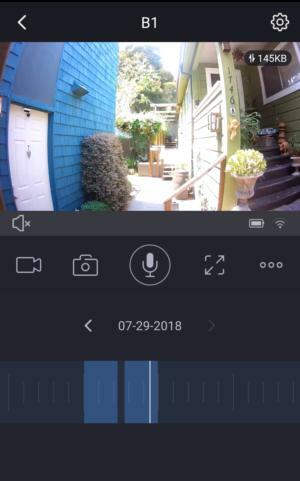 The length of time it takes to get to video clips, however, is troubling when you’re away from home and just want to reassure yourself someone isn’t in your home uninvited, and that could be a significant downside for many users. 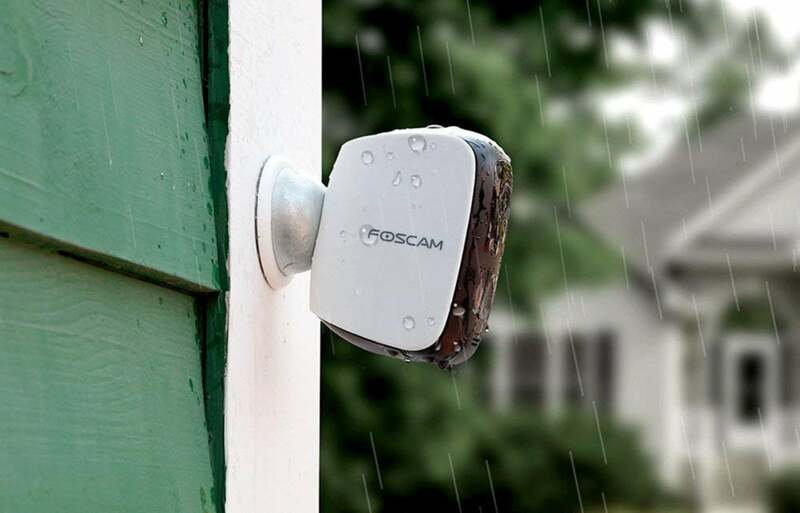 The Foscam E1 is a solid indoor/outdoor security camera if you can tolerate a few quirks.